STAR-K operates regional support centers in Shanghai, China, and Cochin, India. In addition, representative offices are staffed in Manila, Philippines, Colombo, Sri Lanka, Karachi, Pakistan, and Jakarta, Indonesia. Joining Baltimore-based STAR-K Kashrus Administrators Rabbi Avrohom Mushell and Rabbi Dovid Heber, and Rabbis Amos Benjamin and Joel Weinberger, who run the STAR-K Far East and India/Sri Lanka offices, respectively, were STAR-K mashgichim: Rabbis Jonathan Goldschmidt, Yofiel Jacob, Yitzchok Kaufman, Nosson Levin, Aryeh Mendoza, Eli Putney, Ariel Stein, Yosef Wexler, and Shmuel Zvuloni. For some, it was the first time they were able to put a face to the voice, after many a telecommunication. 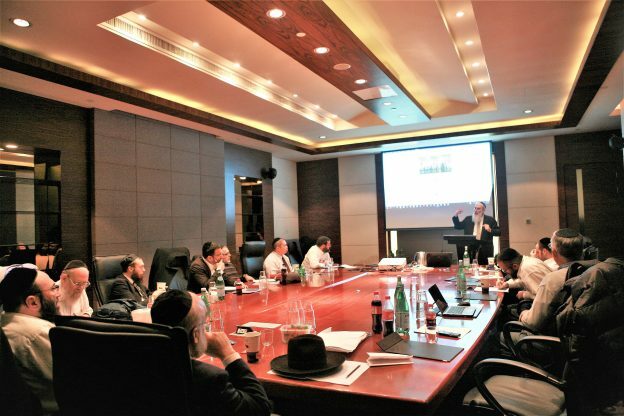 Among the several highlights of the Seminar were: a Shabbaton and Malaveh Malka shiur; an enlightening and heartwarming personal interaction via SKYPE with STAR-K Rabbinical Administrator HaRav Moshe Heinemann; and, an erev Shabbos interactive walking tour of Jewish Shanghai, where the participants learned about the immense effect that the open port of Shanghai had on Jewish migration in the WWII era and the astonishing Jewish life that existed in Shanghai during the war. Among the many topics covered during the event were: Plant report development; Rabbinical prohibitions in kosher law; Insect removal from vegetables- process and methodology; and, the International Dateline and, also, time issues when davening while traveling. Mashgichim and STAR-K office personnel paired up to inspect factories. “I wanted to take this opportunity to thank you for the wonderful Shabbaton I just experienced in Shanghai. As I go back into the field today it is with renewed energy after the inspiring few days that I spent in Shanghai with Rabbi Mushell, Rabbi Heber and all the incredible team of STAR-K Asia Pacific. All the shiurim and events were informative and inspiring. The question and answer session the mashgichim had with Rabbi Mushell was an important opportunity for us in the field to discuss face-to- face with our Kashrus Administrator various things that come up in the factories.Rabbi Heber’s shiur on zmanim and the International Dateline helped me to gain a clear picture and practical guidelines in this complicated area of halacha that the traveling mashgiach encounters a lot.However, without a doubt the highlight, in my opinion, was the question and answer session we had Sunday morning Shanghai time with the Rav HaMachshir Rabbi Heinemann, shlit”a. It was a tremendous zechus to be able to ask various shailas to such an adom gadol. Rabbi Heinemann, shlit”a, answered all our shailas at length with tremendous insight and depth and even a little humor sprinkled in.